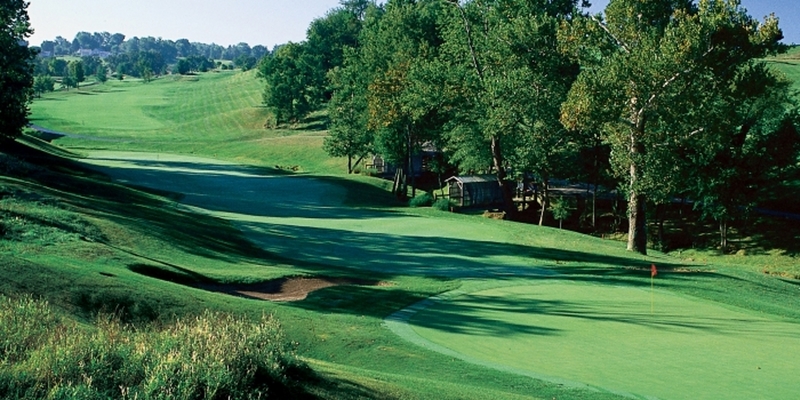 Built on 150 acres of hilly farmland near Zanesville, Ohio, our course has rolling fairways, undulating greens and constant elevation changes. Numerous gorgeous waterfalls, and pristine woodlands of oak, maple, ash, locust, walnut and cherry trees add to its intrinsic beauty. This weekend Special- June 1 and June 2- 7am-11am-$37.00/11am-1pm-$24.00/1pm-5pm-$21.00- Call the Pro Shop at (740)-454-4900 to make these special Tee-Times- Saturday June 1 and Sunday June 2. Traveling east on I-70 take exit 155 (7th Street Exit). At the end of the exit, follow signs for Route 22 West for four miles and the club is on your right. Traveling west on I-70, take exit 155 (Underwood Street exit). At the end of the exit turn left on Underwood Street, and follow the signs for Route 22 West for 4 miles and the club is on your right. 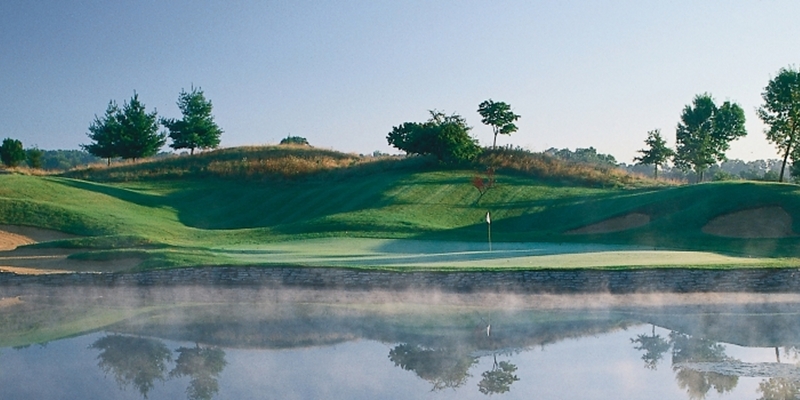 As the person in charge of your next charity or corporate golf outing, we know you have a million and one choices about where to take your event. 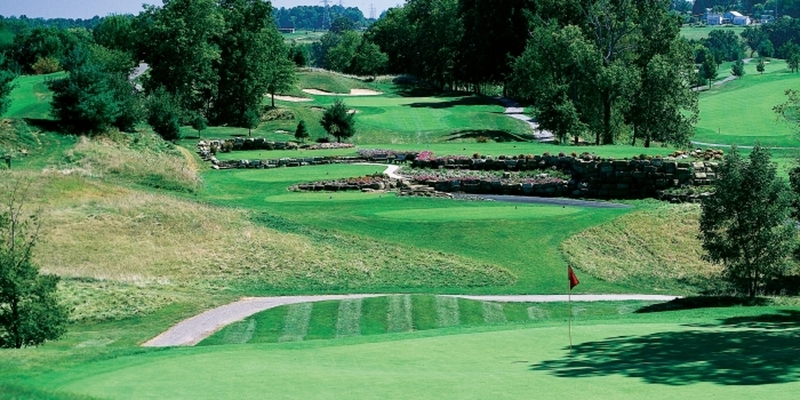 - Highest ranked public golf course in Ohio in 1997, according to Golf Digest. - Just 15 months after it opened, Golf Digest called us the second runner-up among the list of "America's Best New Public Golf Courses." At EagleSticks, we claim all three. Truth is, we put our foot to the pedal when we opened back in 1992 and we've haven't let up. 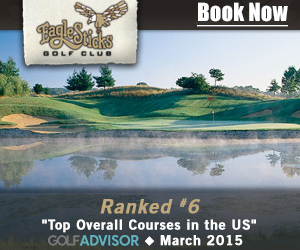 We're consistently mentioned in the same breath with the very best public golf courses in the nation. But we haven't let the publicity go to our heads. Our dedicated, quality-oriented staff knows there is no substitute for hard work, to ensure that a perceived reputation is one that you can truly live up to. A formal garden with ponds, waterfalls and plants, set in a glorious location next to rolling greens and walkways. A beautiful latticework arbor, decorated with greenery and fresh blooming flowers. Amid the fresh air and radiant sunshine, more than 300 guests have taken their places, waiting for the music to start and signal the arrival of the official wedding party. Weddings at EagleSticks are occasions that forever live in the memories of those who attend. That's why we are the area's most popular choice for outdoor weddings and wedding receptions, with wedding events taking place every Saturday during the spring and summer months. Eaglesticks On The Green, our formal garden with full tented reception area, can handle groups as large as 750. Our professional staff has years of wedding experience, which means you can count on us to make sure that all of your wedding plans are taken care of, right down to the tiniest of details. Our wide array of reception areas include a spacious patio which can accommodate groups as large a 200, while our restaurant and banquet rooms can accommodate smaller groups. This profile was last updated on 02/15/2019 and has been viewed 14,758 times.